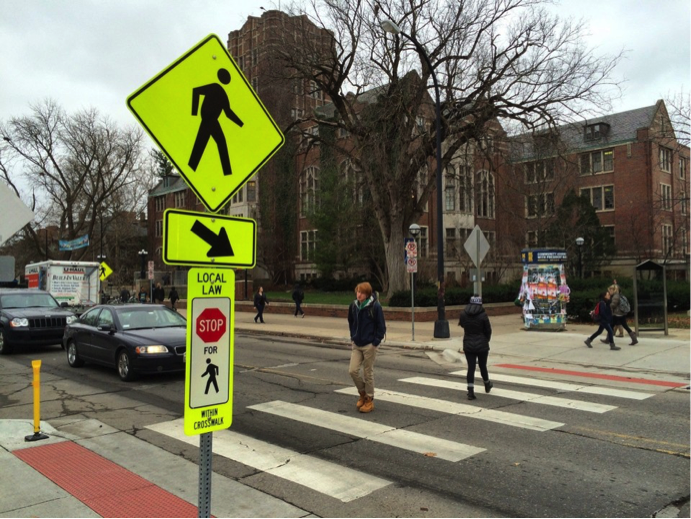 New Grand Rapids Traffic Ordinance Promotes Pedestrian Safety. Buchanan & Buchanan. In February 2018, the Grand Rapids City Commission approved a traffic ordinance that requires vehicles to come to a complete stop for pedestrians at all crosswalks. The ordinance is part of an effort to lower the higher-than-average pedestrian-vehicle crashes. The previous ordinance required drivers to yield to pedestrians, instead of stop. Drivers must stop at all unmarked and marked crosswalks when pedestrians are present. At traffic signals, pedestrians must wait for the “walk” signal before crossing. The new ordinance is party of a larger campaign titled “Vision Zero” which seeks to lower and eventually eliminate pedestrian fatalities and injuries by vehicles. Why did Grand Rapids adopt the “Vision Zero” campaign? Between 2012 and 2015, Kent County reported 790 pedestrian-vehicle crashes. The number is just below Oakland County’s 866 crashes although Kent County has almost half of Oakland County’s population. Have similar campaigns worked elsewhere? Yes. A similar campaign was implemented in Sweden in the 1990s. Sweden has the world’s lowest annual traffic-related fatality rate. What differences will we see to enforce the new ordinance? The “Vision Zero” campaign will use public education activities and place high-visibility enforcement zones at intersections throughout the city. Police officers will provide warnings, educate the public, and issue tickets. As a pedestrian, what should I do to stay safe? Turn off the music! Get off the phone! It is important to be able to hear what is going on around you. If you are at a crosswalk with lights and instructions, be sure to cross when the lights instruct you to walk – but ALWAYS look both ways before crossing. What happens if I am involved in a pedestrian-vehicle accident? In Michigan, if you are a pedestrian and are involved in an accident involving a car or truck, you are eligible to receive Michigan No-Fault insurance benefits (a first party claim) and when the injuries are catastrophic or fatal, you can also sue the at-fault party for pain and suffering compensation (a third-party claim). If your accident does not involve a motor vehicle, usually you cannot collect Michigan No-Fault benefits. Why call us? At Buchanan & Buchanan, we immediately review your claim with you for free by telephone or in person, and if we undertake the claim we will help you obtain the reimbursements you are entitled to for harms and losses sustained. We are experienced and skilled at prosecuting claims of injured pedestrians against negligent motorists and successfully negotiating fair settlements with insurance companies. And, we successfully try these cases for injured pedestrians when insurance companies refuse to follow the law or do what is right. See our recent successful result in a pedestrian-vehicle accident.